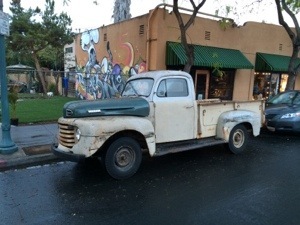 This morning I’m at Rebecca’s Coffee House in South Park. 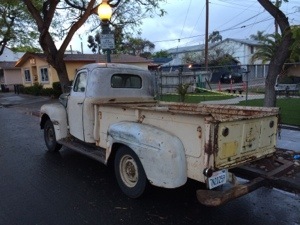 I drove my 1950 Ford F2 which needs exercise every few weeks. 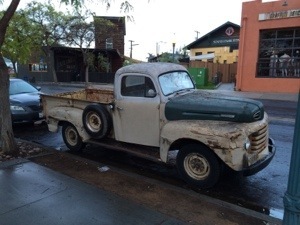 It is a barn-find type truck in its “natural state”. ‘Natural state’ after sixty plus years means, ‘paint falling off’. I have however attended to all of its running gear which remains ‘correct’, ‘stock’, or as original. In other words she is still running her flat head straight six engine and crash-box 4-speed with a ‘granny first’. If we wish to solve our dilemmas and move positively into the future there are a number of things that we can do. Just one of them is education. I’m not thinking of the sort that cranks out people with focused technical knowledge although this is necessary. I am thinking about solving things that have plagued civilization since it began. Think about just one of these, say, war. If we wish to be a truly peaceful society why would we not teach a peace process in school? It does not need to be nor should not be religion based. Possibly one reason is that we have no peace plan to teach. How do we solve this? Maybe start a reality competition? “American Idol Peace Plan Competition?”, “America’s Got Peace Plan?”, “Dancing with the Social Scientists?”. Yes, ridiculous and they will never happen. That was just a thought exercise to get our synapses limbered up. Something more practical would be to link together all of the world’s scientists and scholars from fields as diverse as economics, psychology, physics and biology from every country. Tell them to “leave your ideology at home and bring your science”. Give their group autonomy and ask them to come up with a workable peace plan. This would be making use of the most brilliant minds in the world. Then teach their plan in every school in the world and make this a part of our world culture. Yes, there will be enormous problems with the implementation with this. However we CAN do it.